Conservationists of the Amphibian Survival Alliance have started a new push to protect the world’s amphibians from extinction. a new initiative aimed at safeguarding the world’s amphibians from extinction. Currently, almost a third of amphibians are in danger of extinction, mainly due to habitat destruction and the fungal infection: chytridiomycosis, or chytrid for short. Sad Superstition: In many parts of Panama the Panama Golden Frog is considered a good luck charm and people collect it from the wild to put in their homes. For this reason, amongst others, it is an endagered species. The Indian Space Agency has declared that all communication with the only Indian satellite orbiting the Moon have been lost, The Chandrayaan-1 spacecraft lost radio contact on Saturday. Space Club Freshmen: Iran is the last country to have managed to put a sattelite into orbit. It did so on Feb. 2, 2009. The detailed chemical structure of a single molecule has been imaged for the first time. Although the physical shape of a carbon nanotube has been outlined in the past, this is the first time chemical bonds have shown up in the image. Famous Firsts: The first known photograph was taken by Joseph Nicéphore Niépce in 1825 by the heliograph process. 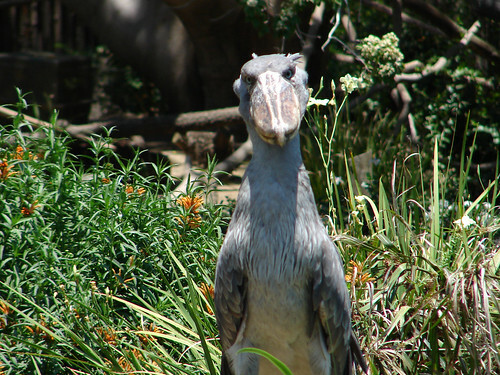 The Shoebill, or Balaeniceps rex, is a large stork-like bird. Its name is based on its huge shoe-shaped bill which it uses to hunt fish and frogs in the muddy waters of Africa. A fractal is an object or quantity that displays self-similarity, in a somewhat technical sense, on all scales. The object need not exhibit exactly the same structure at all scales, but the same “type” of structures must appear on all scales. A plot of the quantity on a log-log graph versus scale then gives a straight line, whose slope is said to be the fractal dimension. The prototypical example for a fractal is the length of a coastline measured with different length rulers. The shorter the ruler, the longer the length measured, a paradox known as the coastline paradox. That is the definition of a fractal according to Wolfram MathWorld. Simply put, a fractal is a irregular geometric shape that can be split into parts, each of which look like the original image. So, as you zoom in on the picture, you continue to see the same image, even though it is many times smaller. This property of fractals is known as self similarity. Have a fine structure on many scales. Be too irregular to define in simple Euclidean geometric terms (triangles, squares, cones, etc). Some famous fractals include the Mandelbrot function (above [Benoit Mandelbrot is seen as the father of fractal geometry]), the Koch snowflake, the Sierpinski triangle (and square), and the Cantor sets. Fractals are more than pretty images that can be defined mathematically. They also have profound implications in many other scientific fields including biology, engineering, medicine, and geography. For example clouds, crystals, snowflakes, mountain ranges, lightning, river networks, and various plants and flowers all follow elements of fractal geometry. Trekkies rejoice, fractal geometry was used to create much of the topography seen on planets in the series. Mountains were created by taking a pyramid and layering it with triangles of different sizes.Trees and ferns have fractal geometry: a branch on a tree resembles a tree and a fern frond resembles a full fern frond. Also, fractal geometry may also determine when a blood vessel branches out into a fork and so on and so on. Discoveries in the field of fractal geometry are revolutionizing the field of mathematics and our view of how nature functions. These discoveries reveal a beautiful, hidden order which emerges from what seems to be chaos. We can apply this new research in many fields to better understand the world around us and create new technologies. As we look closer at everything, one can see patterns crop up out of nothingness. These patterns, be they the simple symmetry of our circadian rhythms or something far grander like the separation of blood vessels in the body, reveal to us a factor which unites us all. Scientists have photographed “upwards lightning”, a rare meteorological phenomenon where electricity flows from the ground to the the upper atmosphere. The photograph was taken during Tropical Storm Cristobal. The “gigantic jets” reached 60 km into the atmosphere and are just as powerful as their opposite-direction travelling cousins. Weird Weather: A red rain storm hit England in 1968. Dust from the Sahara desert travelled with the rain clouds and fell along with the rain, leaving red sand everywhere. According to Canadian scientists, if zombies actually existed, an attack would lead to the collapse of civilization unless dealt with quickly and aggressively. Mathematically, only forceful, frequent uninfected human strikes with great would kill off the zombies. Huh?! : A zombie attack resembles a lethal, rapidly spreading infection. The researchers say the exercise could help scientists model the spread of unfamiliar diseases through human populations. A team of Israeli scientists has developed a patch made from heart muscle that can be used to fix scarring after heart attacks. While a Venus Flytrap is waiting for an insect, its leaves are curved like an inside-out half of a tennis ball. The swelling of cells with extra water triggers the leaf to flip back to its original curved position, closing the fly trap leaves. This rapid plant movement is called “snap buckling.” It gives the Venus flytrap a quick way to close its leaves and trap an insect for nutrients. Aldrovanda, a smaller carnivorous plant, is so small that its cells become turgid so quickly that it does not even have to use the snapping movements based on leaf curvature. Although viewed as an interesting phenomenon for many years, a serious investigation into the movements of sensitive plants was not started started until the 19thcentury. Soon after research began, it was discovered that a loss in pressure in specifically located cells cause the leaves of the sensitive plant to fold and droop when touched. Scientists also do not know how the sensitive plant transmits the signal from one part of the plant to another. Some scientists believe it is done through changes in electrical potential. Others believe it is a chemical hormone-like substance. We can only guess as to why the sensitive plant evolved to exhibit nyctinastic (in response to light changes) and seismonastic (in response to changes in pressure, touch) movements. Perhaps the droopy leaves do not appear to be big and succulent and are therefore less delectable to herbivorous animals. Or the decreased surface area may help conserve water. New things are always being discovered. Every day it seems that new advances are being made in different scientific fields (I wouldn’t have a blog if they weren’t. Just this week: a new way to reduce heart damage, upward lightning, and zombie disease models! Who would have thought (certainly not me). And, as this research establishes new knowledge, we learn more about the world, and the cosmos, in which we reside. That being said, there is still much to learn. As we found out, scientists still do not know much about the mechanisms of sensitive plants: something that almost every middle schooler finds fascinating during their trips to the botanical gardens. Even if a fact is known to the scientific community, it can still be new and exciting to somebody else. For example, I learned about Bladderwort, a carnivorous plant we can find in ponds throughout the world, from a blog I follow (http://winterwoman.net/2009/08/21/bladderwort/). Science is all about making connections between facts and observations. People can only make those when they understand a wide variety of concepts, like the ones we are learning and exploring on a daily basis. PS: Sorry about the belated post. I was moving back into the ol’ university. The Pine Island glacier, one of the largest glaciers in Antarctica, is thinning four times faster than it was 10 years ago. This new information is based on satellite measurements which calculate the glacier receding at 16 meters a year. This drop in glacier size could cause large sea-level increases if current trends continue. Apocalypse Scenario, Kinda: If all the ice on the polar ice caps were to melt away, the oceans of the world would rise an estimated 70 m (230 ft). This would not happen overnight, of course, but how long are we going to put of changing our lifestyle? Early modern humans in Pinnacle Point, South Africa were using fire to improve the quality of their stone tools about 72,000 years ago. This technique may have been an intermediate step between cooking food (800,000 years ago) and creating pottery etc. (10,000 years ago. So what is fire? Fire is the rapid oxidation of a combustible material releasing heat and light energy, as well as other products, like carbon dioxide. 40 years ago, on August 15, the Woodstock Festival began. 3 days of peace, love, and music. Probably the single most important musical event of the 20th century. It may not really relevant to the nature of posts on this blog, but well, we’ll just pop this one under the “soul” category. Birding and Woodstock: The dove perched on a guitar neck in the famous poster announcing ‘Three Days of Peace and Music’ is really a catbird, an American perching bird known for its catlike calls. The Mirror of Time exhibits the human life cycle and the aging process. It was created to show the complexity, resilience, but ultimate vulnerability and shortcomings of the human body. The Brain-Our Three Pound Gem displays brain development and function, as well as brain disease and disorders. This complex organ’s many pathways and mechanisms are also explored. The Story of the Heart is actually an overview of the whole body, as it highlights parts of the muscular system, nervous system, reproductive system, digestive system, and cardiovascular system. Formalin is pumped into the body through the arteries, killing bacteria and halting decomposition. Soluble fats are removed, along with water. The body’s tissues are impregnated with a silicone polymer. This is the actual step involving plastination. The body is then positioned in a way to show the desired parts of the body. Each plastinate usually takes a year to fully complete and cure. Hagens created the exhibit to educate normal, everyday people about the wonder and complexity of the human body, hopefully leading to better health awareness. 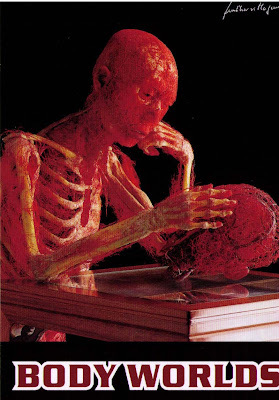 Each exhibit contains around 25 full-body plastinates in positions that display the importance of individual systems as well as the codependency of all the organs. Some of the plastinates show medical prosthetics and others sick or damaged organs. I have gone to the Body Worlds exhibit, specifically, The Story of the Heart, so I feel that I have some insights. The exhibit is not without its controversies. Some people believe that the display of the human body is not consistent with reverence for human remains. Other controversies include the falsified stories that Hagens uses deceased hospital patients from far Eastern countries without consent, as well as executed prisoners, for plastination. Still others say that the exhibit is only profiting off of the macabre desire to witness the “spectacle” of deceased persons. I went to this exhibit and cannot help to feel otherwise. Before I attended, I was afraid that people would act irreverently in the presence of the plastinates. If they were, they certainly hid it very well. The atmosphere was one of stunned awe and honest inquiry, not of sinister sensationalism. It depends so much on the actual intentions of the individual that one cannot make a general statement if the exhibit is “good” or “bad.” If the exhibit inspires people to be more conscious of their health and interested in medicine and the wonders of the human body, then it has fulfilled its purpose. On a personal level, I was amazed at the intricacy of the human body. All of our organs, large and small, are crammed into a small space. There, they must work on an individual and cooperative level to perform processes required for various bodily functions. For example, one plastinate, the hurdler, shows the interplay between all of the muscles required for movement. Another, shows the thousands of intricate capillaries and blood vessels that are all around the human body. Others show the compact positioning of the long digestive tract, or how the skeletal system works together with muscles for movement. Separate organs show how they should look when they are healthy, as well as diseased. One particular contrast was the smoker’s lung, next to a healthy lung. The difference is startling. I would certainly recommend this exhibit to anyone who is honestly interested in the wonder that is the human body. There is a large amount of information to process, however, so do not go when you are short for time. You will want to slow down, explore the different plastinates and marvel in their inner workings. Scientists now have statistical evidence that whole branches from the tree of life are usually lost at once in large extinction events. So, essentially, related species vanish together because they are similar, putting them at risk to the same environmental pressure. This finding is based on an examination of past extinctions, but could help current conservation efforts. A Not So Fun Fact: 24 of the 36 big cat species are either endangered or threatened. A fragment of bone was recently unearthed in Devon, England. This 9,000 year old bone has cut marks from a knife-like stone tool. This suggests that the body was dismembered and possibly consumed. Archeologists believe that the bone damage is evidence that Britons in the Mesolitic Period practiced burial rituals and possibly even ritual cannibalism. Many scientists support the use of geo-engineering to slow the effects of global warming. These methods include giant solar mirrors and spraying a form of aerosol to create “false” clouds. However, new evidence suggests that this may exacerbate drought in many parts of the world., as they would cause drastic changes in precipitation levels. This does not mean that all geo-engineering must stop, however. Instead, the effects should be studied more closely. Craziest Geo-Engineering Idea: According to Roger Angel of the University of Arizona, we should set up an array of deflecting lenses at a point between Earth and the Sun to form a sunshade. What do European Bison, Freshwater dolphins, and African Elephants all have in common? In past months, they have been under intense pressures from humans, putting their future in jeopardy. Freshwater dolphins living in the Amazon river basin are being attacked and killed by local fishermen at an increasing rate. Local fisherman have begun to hit the boto dolphins with machetes and harpoons and left to die. The reason for these attacks is not all together certain. The killings may be a response to the fear that the boto are stealing fish and ruining fishing gear. They also may be caused by the superstition that the animals bring bad luck, such as causing unwanted pregnancy. A research team found 18 dead dolphins, six of which were botos ( Inia geoffrensis ), also known as the Amazon river dolphin or pink river dolphin, and 12 were tucuxi ( Sotalia fluviatilis ), another species that lives in the Amazon basin. The dolphins were not injured beyond their fatal wounds, meaning that the people who killed them did so not for food or bait, but to eliminate them. Researchers stress that an education program which teach children to avoid superstitious and economic conflicts with animals needs to be employed. At 2 meters tall, 3 meters long, and weighing in at 900 kilos, the European bison or Bison Bonasus is Europe’s largest mammal, but its size does not protect it from its dance on the brink of extinction. During World War I, the bison was poached for meat extensively, and they were almost hunted to extinction. There were none left in the wild. This was a terrible genetic bottleneck: when a population is decimated by some wide-scale event. Only the survivors are able to reproduce and pass on their genes, usually limiting the genetic alleles of the species. This in turn limits the species ability to adapt to environmental change. After the war, the 50 odd bison remaining in captivity were put into an extensive breeding program. There were only 4 bulls and 3 fertile females. The breeding program was successful, as the bison now number 800 individuals. However, the species is highly inbred. 90% of the gene pool of the species can be traced to one mating pair. Genetically, there are only 25 individuals left. This is well below the 50 genetic individuals required (according to conservation agencies) for a safe population. The remaining population resides in the Bialowieza forest in Poland. Also, the number of African poached for their ivory is rising exponentially again. In the past five years, 38,000 elephants have been killed annually. This has lead to fears that another ivory holocaust (1970-1980), when Africa’s elephant population plummeted from 1.3 million to 5000,000. At this point in time, if this level of poaching continues, the elephant will be extinct in most of Africa in a mere 15 years. The market for ivory is primarily Asian, where the tusk is used for trinkets and art. This booming market has attracted many organized crime syndicates who can exploit the poor anti-poaching measures taken in many African country to boost their revenue. Once the tusks are shipped out of Africa, it is nigh impossible to determine the source of the ivory. Genetic testing is now being used: cross-referencing DNA found in the tusks to a database of elephant DNA. This reseach has found that poachers will often hammer at a single population repeatedly to obtain their quotas, decimating many populations. To counter this level of organization, Interpol must become increasingly involved in the charge against poaching and ivory trafficking. Well, the votes are in. So, most people want one, longer, in-depth post each week. I will start my regular posting tomorrow again. But once classes start, I shall honor the above description. Thanks for everyone who answered the poll. Soon it will be back to classes. As a result, the amount of time I will be able to devote to my blog will dwindle. So, to save time, but keep the same quality, I have come up with a questionnaire that will help me decide how to change (or not change) the blog. Please take a few seconds and help me with my research. I will just let this post fester at the top until the end of the week, until I reveal a test run of a video post. Then, you guys can weigh in on that.